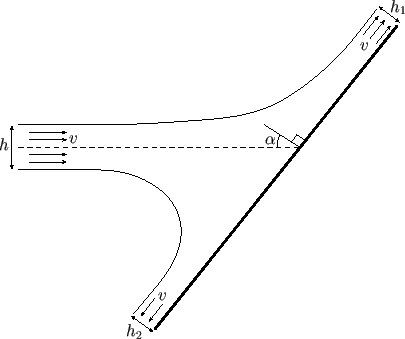 Consider a two-dimensional jet of width and uniform speed that impinges on a rigid plate, at an angle to the normal to the plate, and divides into two streams, running along the plate, whose widths are ultimately uniform, and equal to and . (See Figure 5.14.) We expect the pressure well upstream of the plate to be atmospheric all the way across the jet, because the jet is not yet decelerating. Likewise, we expect the pressure well downstream of the strike point to be atmospheric all the way across the two streams that run along the plate, because the streams are no longer accelerating (and, hence, their widths are constant). It immediately follows from Bernoulli's theorem that the asymptotic flow speed in the two streams is , as indicated in Figure 5.14. 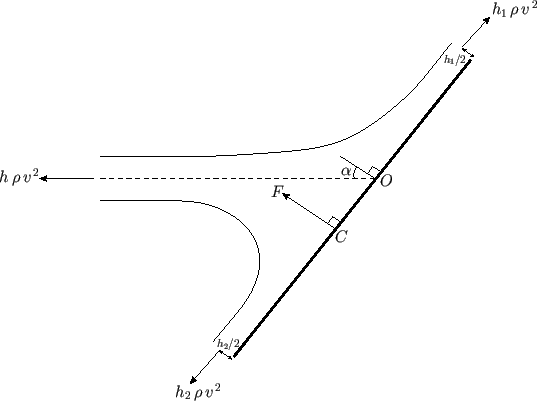 Figure 5.14: A two-dimensional jet impinging on a rigid plate. Figure 5.15: Determination of the center of pressure.